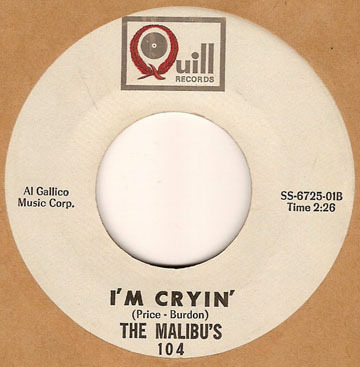 The genius of The Malibu’s 1965 cover of “I’m Cryin” is subtle. In theory, The Malibu’s version is not much different than the Animals’ version. No, the lead singer doesn’t pack as much punch in his howl as Eric Burdon, but he does a great impersonation where he can. What really sets this version apart from the Animals’ version is in the harmonies. Listen carefully to the rising harmonies on each “Ahh.” Give me Eric Burdon on vocals and the Malibu’s on the Ah’s and it’s the perfect song.